We've been renting our home for the past five-plus years, and I love this place, but the stove... ah, the stove is something else. It's electric, it's one of those glass-top deals, and it's an energy saver. But we're stuck with it and an overhead fan that takes little more than delicate, ladylike sniffs of whatever I'm cooking so that the rest of the smoke can billow around the kitchen. In other words, I'm less than delighted with this 3 foot by 3 foot area where I cook our meals. But that doesn't mean that I don't get to stir-fry. It only means that I've learned to adapt, something like the iguanas in the Galapagos Islands. Consider me a Darwinian study in adaptable cooking. Problem number one: making the wok hot enough. This is most likely the main complaint that people have with electric stoves. Gas is great, especially if you can get one of those ferociously hellish rings that shoot flames up the sides of the wok and give that lovely smokiness that Grace Young in The Breath of a Wok refers to as wok hay, "the prized, elusive, seared taste that comes only from stir-frying in a wok." Yes, one of these days I'm going to have one of those stoves and a restaurant grade fan. But now it's just me and that stupid glass-top. The first thing you have to do is make sure that you're using a flat-bottomed wok or pan. Round-bottomed woks are traditional, yes, but they're meant for gas stoves where they can sit on a ring and have their little round bottoms pressed up against the flames. My first wok in high school was given to me by my wonderful friend Wendy, and I was thrilled to pieces at my first piece of authentic Chinese cooking equipment. However, I got so frustrated trying to get the wok hot enough that one day I had the brilliant idea of wrapping the bottom ring with foil to close up all the holes and concentrate the heat. And so I blew out the coil on my mother's General Electric, a sin that was never quite crossed off her list of Major Transgressions. So, find yourself either a flat-bottomed wok that is specifically designed for electric stoves or a good skillet. These come either with a long single handle or two handles; get whichever one appeals to you. I like plain old iron for my woks, and don't care at all those that are light and have nonstick coatings inside. The wok should have a nice heft so that the heat transfers well and so that it lasts years and years, building up a nice patina inside and out that ends up being the best nonstick coating ever. I was given a stainless steel wok that is beautiful, but I've never taken to it for some reason and usually reserve it for steaming things. Iron or stainless steel skillets are good as an alternative, as they give you a wide surface to cook on, and they are versatile. Unless you do a lot of stir-frying, you could do worse than cook on a reliable skillet. Next, figure out which one of your burners is the hottest. If you're not sure, put a cup of water to boil on each burner and see which one boils first. That is your designated wok burner. If your stove is on the verge of pooping out and you can't get a new one for any number of reasons, consider a portable induction cooker or an electric wok. I still have the beaten up old Westbend electric wok I got back in high school after the stove incident, and now that it's old enough to qualify as an antique, I use it as the heating element for my stacked steamers, which frees up my lousy burners for other things. You often can find pretty good electric woks at your neighborhood Goodwill, and portable induction cookers can be bought for well under $100, so they're worth thinking about. Problem number two: getting things to fry quickly rather than steam. We've all stir-fried things only to have a plate of soggy vegetables and flabby meat, and this has a lot to do with what the Chinese call huo hou, literally "fire and time." This is, in fact, one of the main principles of Chinese cooking because you have to be able to correctly determine and control the heat used to cook a particular dish, and you have to know exactly how long to do so. For example, stir-frying strips of beef require a super hot wok and a very short cooking time so that the outside of the meat is seared and crispy while the meat stays tender and juicy. Fish, on the other hand, is rarely stir-fried because it falls apart, so a gentle heat is used for slow pan-frying to ensure that the fish is barely cooked through, but deep-frying requires quick cooking over high heat in order to have a crispy exterior and moist flesh. => Don't move the food around but let it sear. Yes, this is called "stir-frying," but when you are faced with an electric stove of questionable ferocity, toss the ingredients only after they have browned, and skip the stirring until the end when you toss in the sauce. What this does is allow the ingredients to caramelize on the hot metal, and once they build up that delicious brown exterior, they won't stick to the pan so much, their juices will stay locked inside where they belong, and you won't have a lot of moisture to contend with. => Salt or marinate foods that are too wet. Eggplant is one of those vegetables that will drown in its own juices if given half a chance, so salt the cut-up slices and allow them to exude as much moisture as possible. Chicken sometimes has been pumped full of water and will poach rather than fry, so if you are doubtful, marinate it. Defrosted seafood will very act as a sponge, so salt or marinate it before cooking. Pour off the liquid of these ingredients and discard because it is of little use. => Use dry ingredients. If you marinate the meat before stir-frying it, or if you have salted any ingredients, drain it thoroughly and pat off as much moisture as possible. Greens should be rinsed thoroughly before cooking, of course, but try using a salad spinner to remove all of that water that is clinging to the leaves. Another good tip comes from my mother, who would wash greens, wrap them in a tea towel, and then store them in the fridge; they became crispy and dry that way, and it is an excellent way to prep your veggies ahead of time. => Cook small amounts at one time and combine them at the end. This is probably one of those facts that only become obvious once you think about it. If you cook small amounts of any food over high heat, they will cook many times faster than a large amount. But even more important is that the food will fry rather than steam, and get a good brown exterior in the process. If you want to practice this, the best ingredient I've found is fresh mushrooms, particularly Chinese black mushrooms. Remove the stems (reserve them for a stock or soup, as they are too tough for stir-fries), slice them thickly, and experiment with frying different-sized amounts. First fry a small handful. 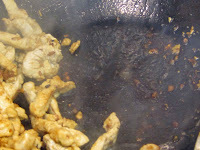 Notice that if you heat the wok up to the point at which it smokes, add your oil, swish it around, put in a small bunch of the mushrooms, and let them sear before flipping them around, they will take very little time to brown and cook. Slide them out of the wok, repeat the step of heating up the wok and adding the oil, and then put in two large handfuls of the mushrooms. Again, allow them to sear before tossing. You will find that the mushrooms won't brown as well and will start producing lots of liquid that will keep the mushrooms from browning and make them stew rather than fry. If your stove is truly and seriously on the edge of burning out, try covering the pan while the food sears, as this will increase the temperature and speed up the searing time. Problem number three: getting different ingredients to cook perfectly. A long time ago I was told the story of a famous gourmet who had a foolproof method for testing cooks who were applying for the position of chef at his residence. Instead of allowing them to whip up fancy meals or exotic ingredients, he asked them to prepare two dishes: fried rice and stir-fried pork with bell peppers. Sounds easy, but it's often the simplest dishes that trip people up, like making the perfect omelet. The point of this story was that the secret to good cooking lies in the details. With the pork dish, it was that the pork and peppers had to be stir-fried separately and combined just before they were served. That way the pork was seared and succulent and the peppers were crispy and barely cooked; at the last minute the two would be combined, sauced, and served. And this is how you need to stir-fry at all times if you want each of the ingredients to shine, even if you have a gas stove, but it's especially important with an electric stove since controlling the heat and the timing is particularly difficult. Let's take that pork and bell pepper recipe as an example. The pork and peppers should be sliced into strips that are just about the same size. This is not only visually pleasing, but the meat and peppers can easily tangle around each other when they are the same size, and so each bite - no matter how dainty - will have a bit of each ingredient and so be fully pleasing. You will notice that there is very little liquid in the stir-fry I've offered below as an example, and that is because I don't want anything to ruin the crispy texture or succulence of the meat and vegetables. Again - and I know I'm repeating myself, but this is important - you want the food to fry at as high a heat as possible and not give it a chance to boil. There is a bit of liquid at the end, of course, in the form of wine and soy sauce, but the heat should be high enough to make the liquid evaporate almost at once and leave only a tantalizing layer of fragrance and taste on the ingredients. If you do see a few tablespoons of liquid at the bottom of the pan, push the ingredients over to the edge of the skillet or up the side of the wok to get them away from the heat (you don't want them to continue cooking), and then rapidly boil down the sauce, which in Chinese is called shou tang, or collecting the liquid. Problem number four: getting ahead of yourself. I know the feeling; you want to just plunge in and start cooking, prepping your veggies along the way and searching through your cupboards as you go, certain that there must be a jar of hoisin sauce in there somewhere. The Chinese have a saying that pretty much sums up this situation: shou mang jiao luan, or "busy hands and chaotic feet." But cooking that way slows things down and gives you lots of room for error because when you are cooking at a fast pace like here, you have to have everything ready to go before you even think about turning on the stove. The French have what they call mise en place, the practice of setting everything out that you will need - all of your ingredients, flavorings, and equipment - so that you are ready to go once you start to cook, and the Chinese have the same concept. When you are dealing with stir-frying, this is without question the way to do it. In fact, if you are cooking a meal with more than one dish, have everything for all of the dishes set out; chop all of your onions at the same time, measure out your oils at the same time, and so forth; it's professional and it looks so reassuring when you are ready to turn on the stove. So, slow down, place all of your prepped ingredients and flavorings and equipment within reach of the stove, read through the directions one more time, and then plunge in. You will find that it makes cooking so much easier and so much more fun. 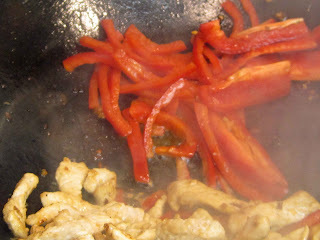 Here is my own favorite take on that pork and peppers recipe for electric stovetops. It is one of those dishes that are really versatile. You can center it on whatever meat you want - or even pressed bean curd - and you can use different vegetables, different sauces, different aromatics. As for what area of China it comes from, this is one of those wonderful dishes that can be found just about anywhere, with the use of beef instead of pork telling you that it is from the North, black beans in the dish suggesting Hunan, chili sauce hinting at the central highlands, and a tumble of shredded bamboo shoots making this more of an eastern dish. 1. Have all of the ingredients cut and measured out before you begin stir-frying. 2. Trim the meat of any tendons or silver skin, but keep the skin if you want if you are using some kind of poultry. Cut the meat across the grain (this makes it tender) into ¼-inch slices, and then into strips ¼-inch wide and up to 2 inches long. (If you are using the pressed bean curd, cut it into the same sized pieces.) If you want, and if you have time, toss the meat in a tablespoon of rice wine to marinate it for 20 minutes or so. Drain thoroughly and pat dry before cooking the meat, as otherwise it will steam rather than sear. 3. 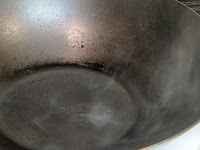 Heat the wok or skillet over high heat (with the overhead fan on high) until it starts to smoke. Add half of the oil to the wok and swirl it around. Immediately toss in the garlic and ginger, let them flavor the oil for a few seconds, and then toss in the meat or bean curd. Quickly toss it around to coat all the pieces with oil, and then let the meat or bean curd sear by not touching it for a short while, until it starts to brown and smell lovely. Toss around the meat or bean curd and let it sear again. Repeat this until most of the meat or bean curd is nicely browned. 4. Scoot the strips up the side of the wok or to the far edges of the skillet so that they stay warm but out of the way; this will also allow the oil to drip down for the next step. Keep the wok on high until the dish is completely done. 5. Add the second half of the oil the wok (adding more oil as needed), and toss in the pepper strips. Let them sear as well, and cook them only until they have lost some of their rawness but are still crisp. Add the green onions and toss them together with the meat and peppers. 6. 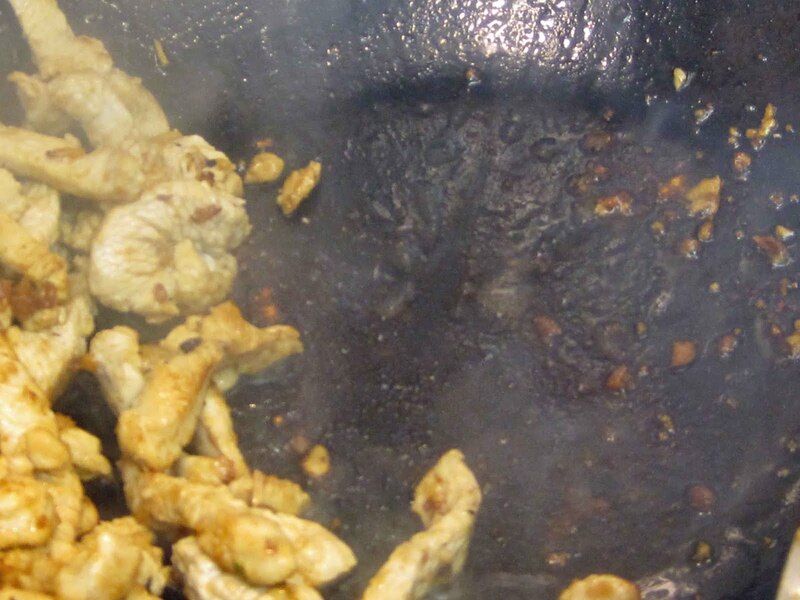 Pour the wine over the ingredients and use your spatula to rapidly loosen any juices at the bottom of the wok or skillet before adding the soy sauce and sugar in quick succession. Toss everything around and taste, adding more of any of the seasonings as needed. Sprinkle the sesame oil over the ingredients, make one final toss, and plate. Serve immediately. This is the most sensible post I've ever read about stir frying in imperfect conditions and how to cope. I laughed and came away feeling hopeful - I'd about given up on the idea as relatively tasty mush with no distinct flavors is still mush! Thank you! Thanks, John! You made my day. If you have a good, seasoned carbon-steel wok, (about $35 new, $5 at thrift stores), they pick up heat amazingly fast. We're using a 14" wok and had this problem of the glass-top stove. The solution is to use a cast iron burner top for a gas stove. Not the square ones, the round ones designed for antique gas stoves with round burner pans. We found some at a thrift store and used them to elevate green peppers for charring, a bit higher off our old gas stove back at the previous rental. So we kept them. Turn the burner top upside down. The "arms" will rest on the large burner of the stove, and the circle is perfect for the bottom of a round-bottom or flat-ish bottom wok. It'll raise the wok about half and inch above the burner, and make the stove use radiant heat instead of direct contact heat. We use about medium-high (#8)for the burner, and in about 3-5 minutes, can bring peanut oil to smoking (around 450-degrees. From there, everything goes like magic. The ring on the bottom of the cast iron burner is heavy enough to provide nice stability. Just don't slide it around and scratch the glass on the stove. That would be Against The Law of the manufacturers. We make fried rice, with day-old long-grain rice cooked first in a rice-cooker for perfection. Let it dry a day or two, uncovered in the fridge, and it freezes forever. 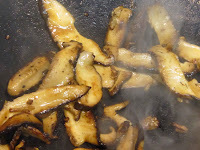 To fry it, before the rest of the stuff, we use about 1-1/2 TBsp of sesame oil --- the clear, not the toasted. That has a smoke-point of around 450 also, and it gets to heat in about 3 minutes. There's not enough smoke to bother the sister-in-law of that ventilator hood you're using, so no complaints there. And we don't get the billowing smoke throughout the open-design kitchen that alerts the fire department. That would also be Against The Law of the manufacturers, I'm sure. Old, antique cast-iron circular burner top from a gas stove. Upside down. That's the ticket, and I think it cost us about $4 for the burner top. Let it cool while eating dinner and you'll never accidentally drop it on the glass stove-top. That too, would be Against The Law. absolutely amazing. the instructions are spot on. You made my day. Thanks! You're quite welcome! I have actually used my flat-bottomed wok on my glasstop for years now with no problem, but your idea of cooking outside sounds wonderful, especially since you don't have a fan. Washing down the walls does not sound at all fun! I wish I could nominate your blog for a James Beard award. Seriously good stuff. Thank you! Aw, thanks, James. That's the sweetest thing to say, and much appreciated!